Hi guys! 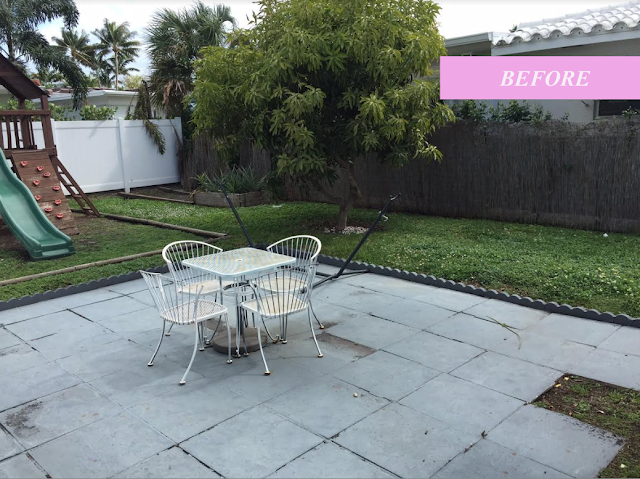 I'm so excited to share with you my backyard makeover, which I've been working on for the past couple months. I partnered up with Lowe's Home Improvement to create my perfect outdoor oasis and couldn't be happier with how everything turned out. 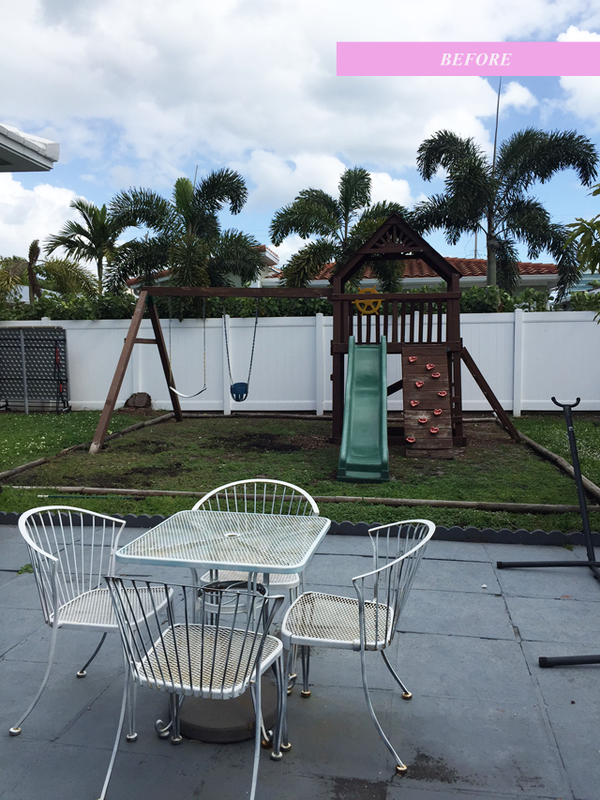 As you can see from the before pictures, there really wasn't much going on with the backyard. The weeds had taken over Andy's playground, it needed new flooring, and there really wasn't a place to comfortably sit. When me and my late husband first bought this house in Surfside, Florida eight years ago we spent the majority of our effort renovating the inside, that we completely overlooked the backyard. 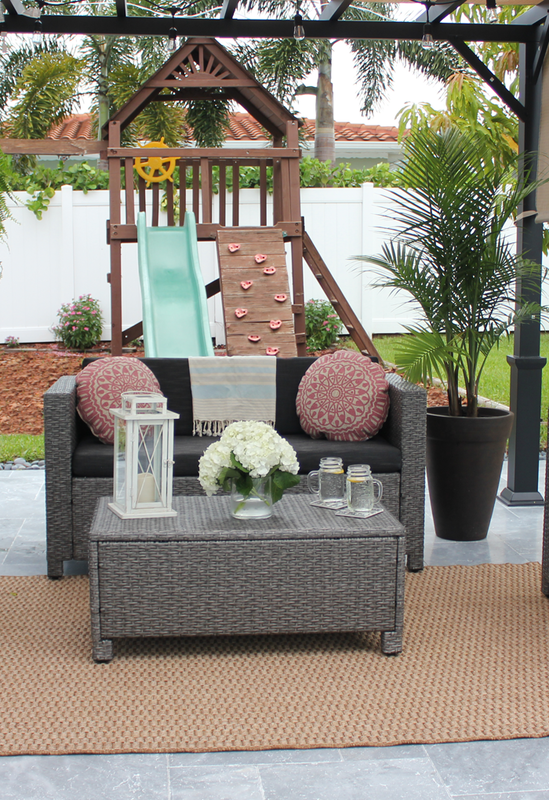 Now that my son is four, I really wanted to take advantage of this space (and year-round beautiful Florida weather) to create a backyard he can enjoy, but at the same time create my own little oasis. One thing that was also missing from the backyard was shade! I guess that's another reason why I didn't spend too much time outdoors. That's where this uh-mazing pergola from Lowe's came in. It was the answer to my problem and not to mention super affordable. 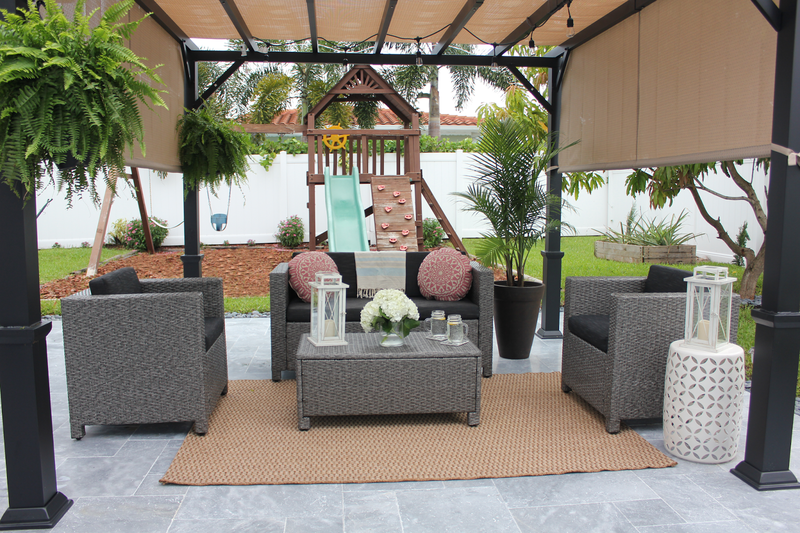 It provides the perfect amount of shade and also helps create more of a living space. You'll also notice I got rid of this ugly fence that was on the side of my house and put up a new white fence to match the one my neighbor had. I was so excited to finally have real outdoor furniture. 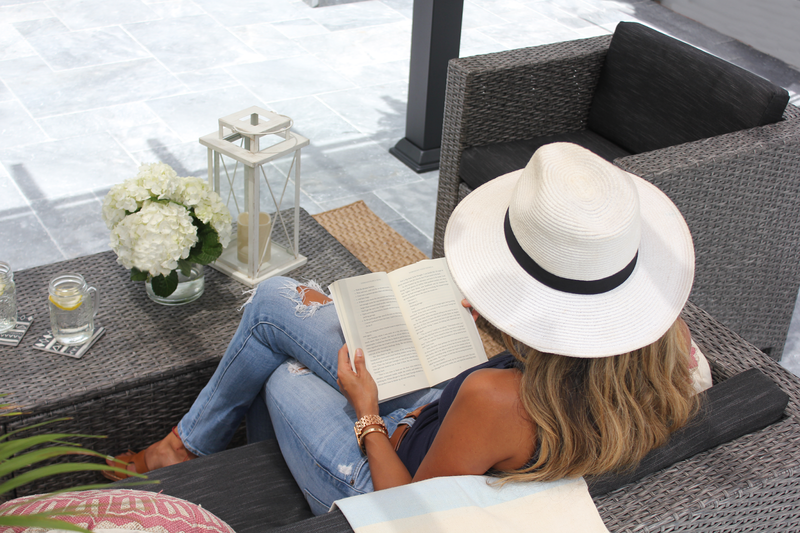 I chose this Home Decor Puerta 4-Piece Wicker Patio set and loved how it went perfectly with that earthy theme I was going for. I'm also really proud of the fact that I assembled it myself. To be honest though it was pretty easy. It came with all the tools necessary and took me about 1 1/2 hours to put everything together. The accessories in my opinion is what really brings the space together. 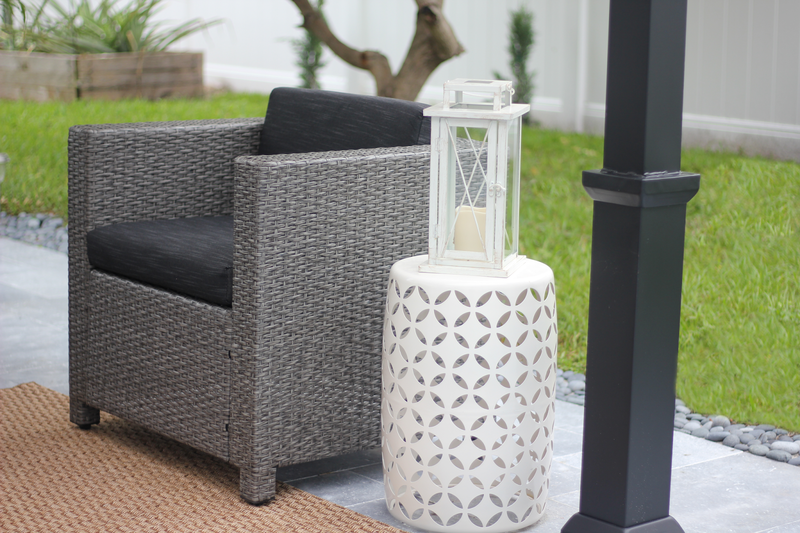 I immediately feel in love with this white garden stool and Led lantern from Lowe's. The best part is that it's battery-operated and it flickers to simulate the glow of a candle. So you get the feel of a real candle without the risk of a fire. I'm always paranoid about having my four year-old near candles, so this is perfect. 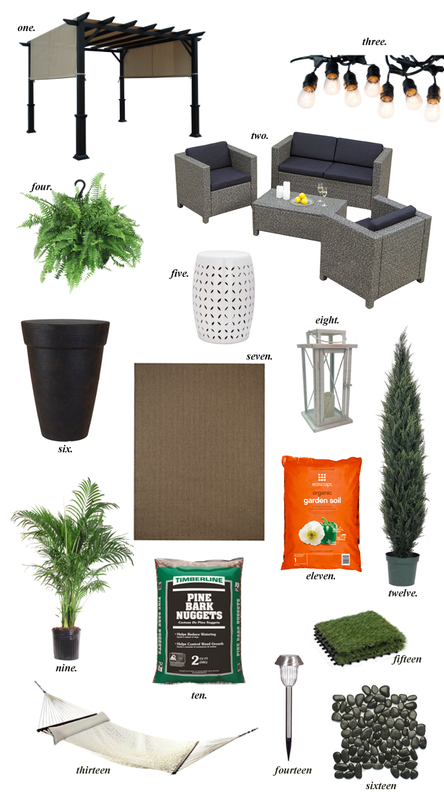 I also wanted to add a lot of greenery to my space and found everything I needed at Lowe's. They have such a great selection of plants. 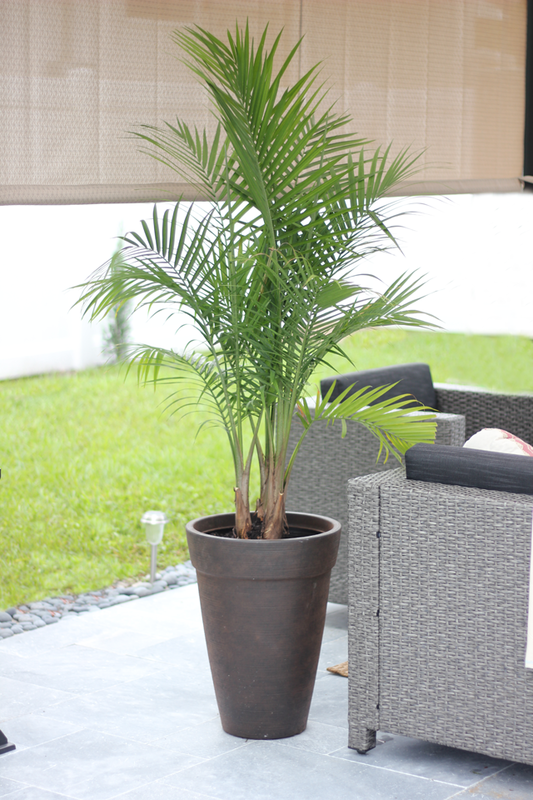 I went with this Areca Palm for that tropical feel. I also hung some Boston Ferns from the pergola and planted some Italian Cypress trees by the fence for privacy. Right now they are small, but eventually they will grow very tall. This planter was also a steal. It looks like ceramic, but it's actually made out of plastic---so it's easy to move around and I don't have to worry about it breaking. To finish the landscaping, I also got sod to fix the dead spots in my lawn. The folks at Lowe's were super helpful and even helped me carry and put everything in my car. I always dreamed about having string lights in my backyard. I added these Portofolio String Lights to the pergola and it makes it look so romantic and dreamy at night. I currently don't have any other type of lighting in my backyard, but these provide so much light you really don't need anything else. I also installed new pavers and finished the edges with these round stone pebbles in charcoal grey. I love how it gives it that zen look. 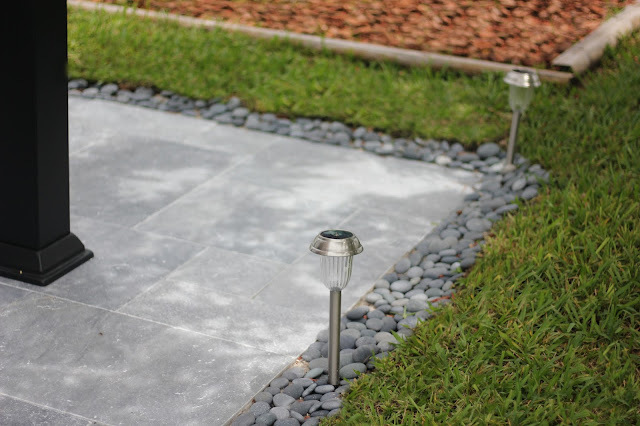 I also added these solar path lights, which already come with a stake to stick in the ground. For Andy's playground, I removed all the weeds and added a weed fabric to prevent them from popping up again. Then I added pine bark nuggets. I'm so happy to finally have a space where I can relax, read a book, or just have a glass of wine in the evenings. Here's where you can get everything at Lowe's to create your own outdoor oasis. If you have any questions about the makeover, feel free to leave me a comment below. Thank you to Lowe's Home Improvement for partnering with us on this makeover and thank to all of you for supporting our amazing sponsors.